Perfect for shooting landscapes or taking discreet snapshots, with a picture angle approximately that of the human eye. This 35mm f1.8 prime DX NIKKOR lens has a fast aperture which delivers subtle background blurring with a shallow depth of field. Incorporating the NIKKOR Silent Wave Motor (SWM) for quiet accurate focus operation. When used with a DX-format digital SLR camera, the picture angle is the 35mm equivalent focal length of 50mm. 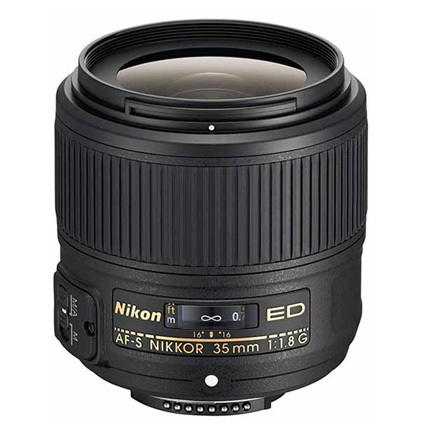 Featuring a rounded seven-blade diaphragm opening, the Nikon 35mm AF-S f1.8 prime lens makes out of focus elements appear more natural. The AF-S NIKKOR 35mm f1.8G has two focus modes; M/A (manual override autofocus) and M (manual focus).